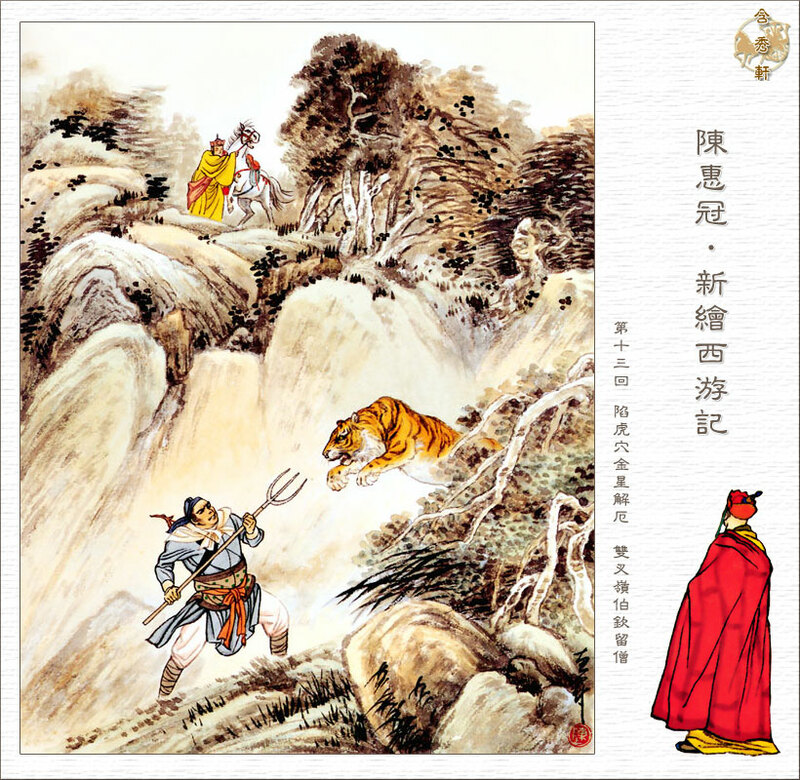 Sanzang continues his journey alone when a ferocious tiger appears in front of him. Being by himself and unable to think of a way out, Sanzang prepares to abandon his mind and body and let Heaven do as it will. However the tiger runs away when a man comes across the hillside with a steel trident in his hand who introduces himself. “My name is Liu Boqin and I am known as the warden of the mountain. I came along here because I wanted a couple of animals for the pot. You must come with me to my hut, and your horse can rest. I’ll take you on your way tomorrow.” Sanzang, who is delighted to hear this, thanks him and goes along behind him, leading the horse. After they arrive at the hut Sanzang is introduced to Liu Boqin`s mother. She says; “Tomorrow is the anniversary of your father’s passing away, and I would like to trouble the venerable monk to say some prayers and read a sutra for him; you could take him on his way the day after.” The next day, Sanzang recites first a prayer to purify his mouth, then a holy spell to purify his body and mind, and finally the Sutra to Deliver the Dead. 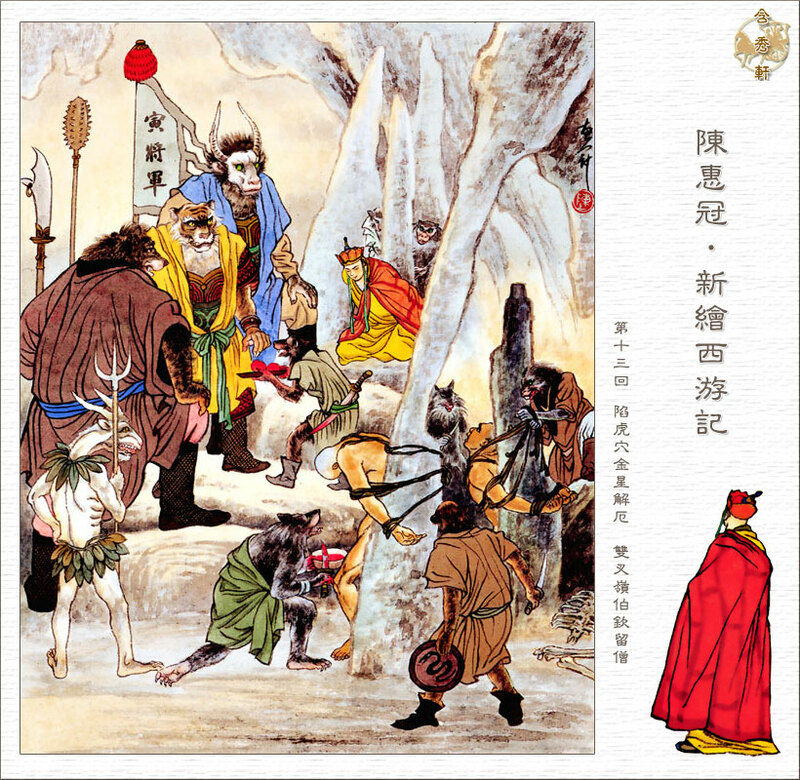 When he has finished, Boqin asks him to write out a letter of introduction for the dead man and also recite the Diamond Sutra and the Guanyin Sutra. Sanzang recites them in a loud, clear voice and then ate lunch, after which he reads out the several chapters of the Lotus Sutra and the Amitabha Sutra.